The cloud was discovered using data from NASA’s Lunar Atmosphere and Dust Environment Explorer, or LADEE, which launched in September 2013 and orbited the moon for about six months. A detector on board called the Lunar Dust Experiment (LDEX), designed and built at LASP, charted more than 140,000 impacts during the six-month mission. A paper on the subject appears in the June 17 issue of Nature. Co-authors include LASP research associates Jamey Szalay, Sascha Kempf, Eberhard Grun and Zoltan Sternovsky, as well as Juergen Schmidt from the University Oulu in Finland and Ralf Srama from the University of Stuttgart in Germany. Horányi said the first hints of a cloud of dust around the moon came in the late 1960s when NASA cameras aboard unmanned moon landers captured a bright glow during lunar sunsets. Several years later, Apollo astronauts orbiting the moon reported a significant glow above the lunar surface when approaching sunrise, a phenomenon which was brighter than what the sun alone should have been able to generate at that location. Since the new findings don’t square with the Apollo reports of a thicker, higher dust cloud, conditions back then may have been somewhat different, said Horányi. The dust on the moon—which is dark and sticky and regularly dirtied the suits of moonwalking astronauts—was created over several billion years as interplanetary dust particles incessantly pounded the rocky lunar surface. Knowledge of the dusty environments in space has practical applications, said Horányi. Knowing where the dust is and where it is headed in the solar system, for example, could help mitigate hazards for future human exploration, including dust particles damaging spacecraft or harming astronauts. 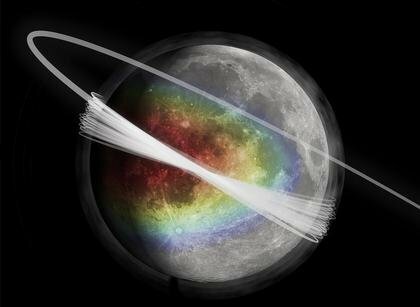 Many of the cometary dust particles impacting the lunar surface are traveling at thousands of miles per hour in a retrograde, or counterclockwise orbit around the sun—the opposite orbital direction of the solar system’s planets. This causes high-speed, near head-on collisions with the dust particles and the moon’s leading surface as the Earth-moon system travel together around the sun, said Horányi. The Geminid meteor showers occur each December when Earth plows through a cloud of debris from an oddball object called Phaethon, which some astronomers describe as a cross between an asteroid and a comet. “When these ‘beams’ we see from meteors at night hit the moon at the right time and place, we see the cloud density above the moon skyrocket for a few days,” said Horányi. Horányi also is the principal investigator on the LASP-built Student Dust Counter on board NASA’s New Horizons spacecraft that will whip by Pluto on July 14 after a journey of more than nine years.